Manufacturing of plywood - one of the types of wood-based panels - in Hainan province, China. A new United Nations report has indicated that global manufacturing growth is expected to remain low in 2016 due to weakened financial support for productive activities. The quarterly World Manufacturing Production report, published by the UN Industrial Development Organization (UNIDO), has stated that with financial uncertainty still looming across Europe, foreign direct investment has not yet reached the 2007 pre-crisis level. According to a UNIDO news release issued yesterday, world manufacturing output is expected to increase by only 2.8 per cent in 2016. However, in contrast to recent years, there will be no breakout from the low-growth trap in 2016. The agency also warned that lower industrial growth rates pose a challenge for the implementation of Sustainable Development Goal (SDG) on promoting inclusive and sustainable industrialization and foster innovation, as encapsulated by Goal 9, which also aims to significantly raise the share of manufacturing in the economies of developing countries. It further stated that that manufacturing production is likely to rise by only 1.3 per cent in industrialized countries and by 4.7 per cent in developing ones. In terms of growth rates for countries, the growth rate performance of China, the world’s largest manufacturer, is likely to further decline from last year’s 7.1 per cent to 6.5 per cent this year. Russia and the United States recorded marginal rises of 1.0 per cent and 0.3 per cent, respectively. Manufacturing output in Japan, however, fell by 1.8 per cent. India too suffered a sudden 0.7 per cent drop in growth figures. In contrast, other Asian countries largely maintained higher growth rates. Manufacturing output rose by 5.6 per cent in Indonesia, 3.9 per cent in Malaysia and 13.5 per cent in Viet Nam. Additionally, in Europe, the uncertainty following the Brexit affected the growth rate performance in manufacturing in the second quarter of 2016, below 1.0 per cent for the first time since 2013. Among Latin American economies, manufacturing output fell by 3.2 per cent in the second quarter, amid a continuing production decline in the region. 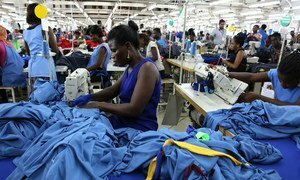 The report further noted that, based on estimates from the limited available, manufacturing output rose by 2.5 per cent in Africa. South Africa, the continent’s largest manufacturer, significantly improved its growth performance to 3.3 per cent in the second quarter. Higher growth rates of 8.3 per cent and 7.6 per cent were achieved in Cameron and Senegal. In terms of growth estimates by manufacturing sectors, the report stated that the production of tobacco fell for the second consecutive quarter, declining by 2.6 per cent. It also stated that developing economies maintained higher growth in the production of textiles, chemical products and fabricated metal products, while the growth performance of industrialized economies was higher in the pharmaceutical industry and in production of motor vehicles.